Boozenews Editor: Look forward to the English version. A great way to educate kids. France’s alcohol laws mean children aren’t learning about their wine heritage, the editors of a new children’s book about wine say. 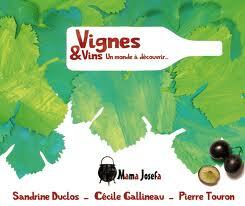 Vignes et Vins: Un Monde a Decouvrir (Vines and Wines: A World to Discover) by Sandrine Duclos and Cécile Gallineau aims to tell 7 to12-year-olds how lucky they are to live in a country where the culture of the vine plays such an important role. With the help of illustrations it explains the cycle of vine-growing and the cultural role that wine plays in France, and tells the story of wine from the Romans to the present day. The book was launched this week at Chateau Fonroque in Saint Emilion, a biodynamic property owned by Alain Moueix. A spokesperson for Moeuix told Decanter.com he was interested in the project because of its emphasis on the natural side of wine-making, and its ‘green’ values – the books have all been printed and bound without the use of any glue or printing varnishes.